At Bosinver, we’re lucky enough to have several family friendly beaches and attractions right on our doorstep. A few minutes in the car and you can be at Pentewan beach. It’s a safe, sheltered beach with golden sand (great for building sandcastles) and perfect for a family day out. 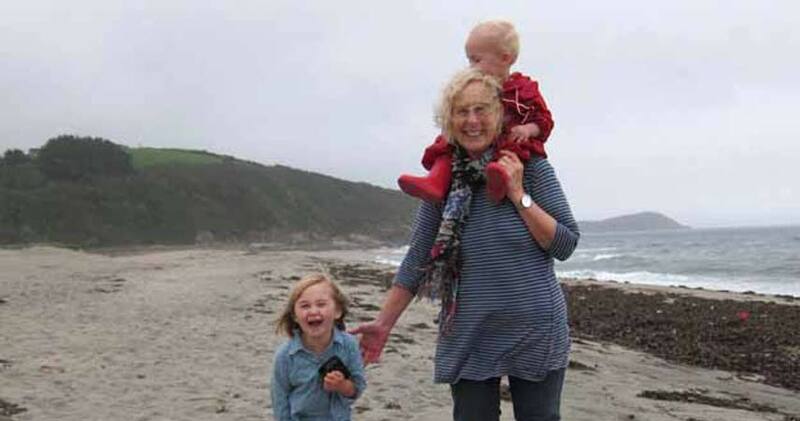 As a frequent visitor to Pentewan, here’s what Nanny Pat has to say about it. “Pentewan is probably the closest beach to Bosinver and we often head here if we only have a couple of hours to spare. Part of the beach is privately owned so if you want to spend the day here, turn left into the village past the Ship Inn (which does good food) and park in the car park on the right and follow a path through the sand dunes to the beach. If you’re only here for part of the day, carry on and enter the Pentewan Sands holiday park following signs for The Seahorse. This is a great leisure facility with a big indoor pool with slides and toddler pool, plus a soft play and restaurant. As long as you use the leisure centre or restaurant you can park here and go down to the other side of the beach where there is a funky beach bar called the Driftwood Bistro. For some reason there is always a lot of debris on this beach so being mindful and hoping to teach Wilf and Megs a thing or two about social responsibility we find the largest container (often a fish packing crate) and make it our mission to fill it with plastic and talk about what problems our rubbish creates for fish, birds and other wildlife around the world whilst we do it. We drag the full crate to the bin area and then off to play on the beach – even in the depths of winter. Skimming stones, playing tag, drawing faces in the sand and collecting pebbles with faces on can keep little ones occupied for several hours out in the fresh air. There is a small playground on this beach but it is showing signs of age! Dogs are welcome on the beach during the week from 1 November – mid March but outside these times there’s a seasonal dog ban. Pentewan is less than 10 minutes’ drive from Bosinver. Turn left out of our driveway then left again into Polgooth village. Continue through Polgooth till you reach the T junction opposite the Kingswood restaurant. Turn right towards Mevagissey on the B3272. Pentewan is approximately 2 miles along this road on the right. The entrance to Pentewan Sands is clearly marked. Have you visited Pentewan or The Seahorse leisure facilities? We’d love to hear what you think.